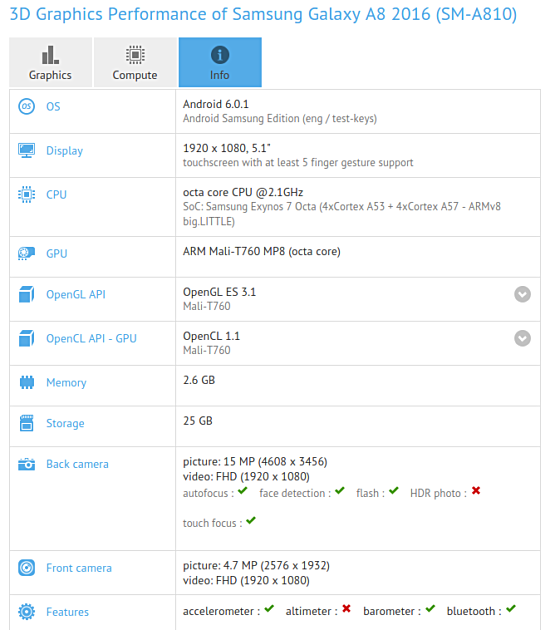 The SM-A810, which is alleged to be the Galaxy A8 (2016), has been spotted on GFXBench. The benchmark listing reveals the device is powered by an octa-core 2.1GHz processor (Exynos 7420 chipset) and sports a 5.1-inch full HD display. RAM is 3GB, while internal memory is 32GB. In terms of camera, the handset features a 16MP rear unit and a 5MP front shooter. It runs Android version 6.0.1 out of the box. The SM-A810 was also recently spotted on Zauba, revealing a price tag of around $205.